Escape south of the border with a Top Notch Mexican Fiesta. 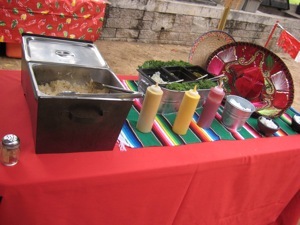 Enjoy some freshly grilled carne asada and get a drink from the Cantina before the soccer kicking contest begins. 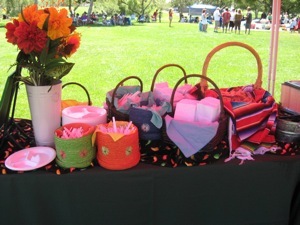 Every detail of the Mexican Fiesta is carefully coordinated from the colors of the linens, umbrellas or canopies to the flowers, fiesta pennants, sombreros and staff uniforms. Themed prizes are even given away. 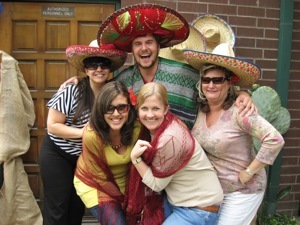 Complement your Mexican Fiesta with a Mariachi band, Margaritas or a photo board for great guest souvenirs. "One little girl of 3 years asked her Dad if we could do it all over again this weekend"